Author’s Note: This is the final part of the Killer Cross. After the conclusion, I will discuss the real reasons why we believe Chris McNeill refused to use it. 120. Q: Deputy McGuire, I presume you do know the difference between 1 gram and 0.1 grams, don’t you? 121. 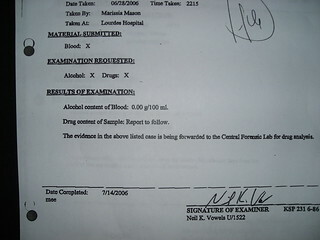 Q: When you booked the controlled substance into evidence, you wrote in your report that it weighed 1 gram, didn’t you? 123. Q: But the substance weighed by the lab analyst at the Kentucky State Crime Laboratory was only one tenth of a gram, right? 124. 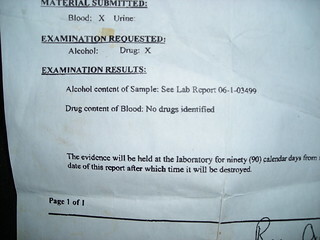 Q: You sent the blood sample to the crime lab for analysis before the preliminary hearing, didn’t you? 125. Q: But you didn’t send the substance that you knew all along was gonna be crack until after the preliminary hearing, right? 126. Q: That’s because you knew what it was going to be all along, even though you didn’t know how much it was going to weigh, correct?. 127. Now, I know I’m not your lawyer, so you may want to consult a lawyer, if you don’t already have one and tell her what happened here today. I’m sure she will tell you that the only way to avoid a perjury indictment is to recant your lies and finally tell the truth, but we’ll leave that for another day and another jury. Author’s Note: I doubt any lawyer would have made the last statement because it is improper. It is not a question and it is argumentative. What is the significance of the weight difference? We believe the deputy did not recover a controlled substance from underneath his back seat when he pulled the seat back to search for her watch. Recall that, when they arrived at Lourdes Hospital, she told him that her watch had fallen off her wrist during the ride and she asked him to please retrieve it. I find it impossible to imagine that she would have asked him to retrieve her watch, if it had fallen off her wrist while she was attempting to slough a rock of crack behind the back seat. That would be like asking the deputy to retrieve my watch and, while you’re at it, please pickup my dope. That does not make any sense. A few months after the arrest, the police officer in charge of the McCracken County Evidence Unit was arrested at a flea market in an adjoining county for attempting to sell a handgun that he had removed from the evidence unit without proper authority. The gun was loaded and the person to whom he was trying to sell it accidentally shot himself. The wound was not serious, however, and he survived. As I recall, the newly elected sheriff, arranged for an inventory to be made of all of the items in the Evidence Unit by an independent auditor. The final report was disquieting to put it mildly. The unit was not secure. In fact, it was not exclusively used to store evidence with access limited to the people who worked in the unit. That is standard procedure for police departments all over the country. I believe the auditor also reported that a room within the unit was used as a lunchroom by civilian employees and police personnel at the Sheriff’s office. In other words, it was basically an open-air pharmacy with guns, drugs, and money available to anyone who worked at the Sheriff’s office at anytime. The auditor found evidence missing as well as evidence stored in lockers that was not even listed as evidence on the inventory sheets and logs maintained by the unit. One would have expected a thorough investigation of everyone who worked at the Sheriff’s Department and prosecutions of people who stole stuff, but the only person prosecuted was the boss who attempted to sell the loaded gun. He pled guilty to some relatively minor offense and that was it. The story disappeared. I googled the story today looking for the name of the officer in charge of the evidence unit and verification of what I recall, but could find no reference to the story, which has apparently been scrubbed. I find that troubling. 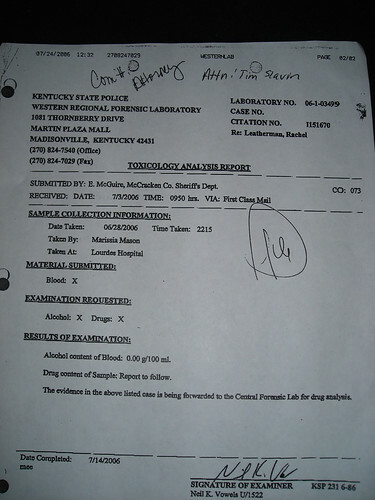 We believe Deputy McGuire wanted a notch on his gun, figuratively speaking, and he planned to obtain some heroin in the Evidence Unit by raiding a drug exhibit, but he could not find any and had to settle for crack, which would account for the weight discrepancy (0.1 grams versus 1 gram) and for his delay in sending the rock to the Kentucky State Crime Laboratory for analysis. We believe he formed this plan on the way to the hospital after the roadside searches failed to turn up any drugs, paraphernalia, or drug residue. He likely seized something like a bread crust, perhaps from something he ate earlier in the front seat of his vehicle before the stop, which occurred at approximately 8:20 PM. Or, maybe he found it under the back seat when he retrieved her watch. Wherever he found it and whatever it was, he probably discarded it after he booked her into jail. 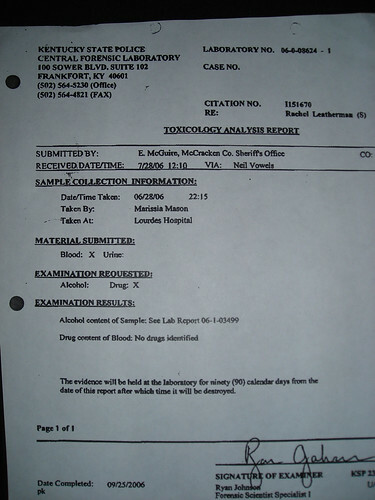 He filled out his narrative report and entered 1 gram as the approximate weight of the suspected controlled substance, intending to later obtain a small amount of heroin in the unit and send it on for analysis to the crime lab. We think it significant that he charged her with possession of a controlled substance without ever specifying what he thought it was in the Uniform Citation or his narrative report. When I called the court the next day after Crane Station’s arrest, I was told by a court official named Kimberley Thornton that Crane was charged with possession of heroin, tampering with evidence, and DUI. Someone must have told her that Crane was charged with possession of heroin because the drug was not mentioned in the deputy’s paperwork. I went to the preliminary hearing a week later believing Crane was charged with possession of heroin only to discover that she was charged with possession of crack cocaine. How did he know that, unless he already knew for certain what it was because he obtained it from the Evidence Unit after he could not find any heroin? If he did this, he would have done it several months before the scandal broke about the evidence unit. That did not happen until after the new sheriff was elected and he was elected in November 2006. Crane Station was arrested in late June, 2006. The purpose of the cross examination was to so utterly destroy Deputy McGuire’s credibility that the jury would believe him capable of almost any misdeed, including perjury and planting evidence. 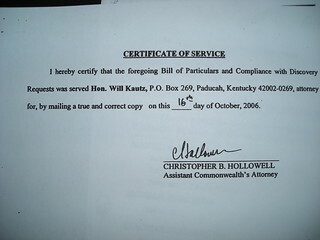 Whether I would have made that argument had I represented Crane Station, which I could not do because I was not admitted to the Kentucky Bar, would have depended on some investigation that had not been done, and receipt of additional discovery that had not been requested, despite my recommendation that it be requested. I may have elected to leave out the specific theory and rely on reasonable doubt based on Deputy McGuire’s shredded credibility. Whether I would have argued that the deputy was a perjurer who planted evidence or a confused young man with an extremely poor memory such that he was incapable of establishing anything beyond a reasonable doubt is unclear, although I would have been sorely tempted to go for the hard approach. Finally, in the spirit of fairness, I must point out that I neglected to include a series of questions in the cross about the deputy’s testimony at the preliminary hearing when he said the watch and the controlled substance were not in plain view. He testified at the suppression hearing and later aqt the trial that they were in plain view in the seatbelt crack next to where she was sitting. Both statements cannot be true. I drafted this set of questions by hand over a period of two to three hours and simply forgot to include them, but I do recall telling McNeill that they should be included. Now, why did Chris McNeill throw the case by refusing to use this devastating cross? We do not believe he was telling us the truth when he said the jury would get angry if he used the cross examination since Deputy McGuire was young and innocent. We have come up with three possible reasons. 1. 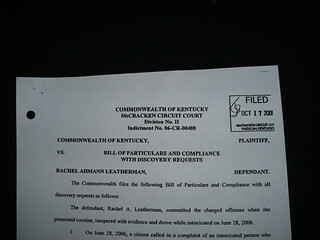 He is the regional chief of the public defenders office for a multi-county area in western Kentucky. In order to protect his budget, he has to assist in keeping the railroad running on time. Therefore, he has a strong interest in not ruffling anyone’s feathers and that means not fighting too hard in some cases. This is a built-in conflict of interest and I don’t think any lawyer in his position should be trying cases. Besides, running the office is a full time job. 2. He wanted to be appointed by the governor to replace a retiring circuit court judge, so taking on the corrupt legal system in western Kentucky was the last thing on his agenda. He didn’t get the job, btw. The chief prosecutor did. 3. He doesn’t have the stones to go to war. He is too timid to take on corrupt cops, prosecutors, and judges. He also lacks integrity. He is not a stand-up guy. Anyone who is too timid and dishonest to fight for his client does not have the right stuff to be a criminal defense attorney. McNeill did not order the preliminary hearing to be a part of the record on appeal and this delayed action by the Court of Appeals for one year. We believe he did that deliberately because that is when Deputy McGuire testified that the watch and the controlled substance were not in plain view and he had to pull back the seat where he found them after she asked him to look under the seat for her watch. We believe he did not want the Court of Appeals to see that transcript, as it would show that he provided ineffective assistance of counsel in violation of her Sixth Amendment right to counsel. Most people do not realize this, but criminal defense lawyers are our last line of defense and only hope for keeping the system honest. Honest and knowledgeable judges and prosecutors know this to be true and will openly acknowledge it. 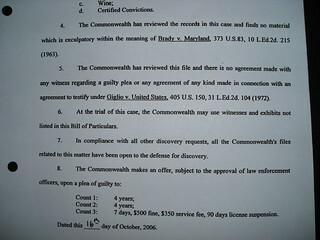 Corrupt judges and prosecutors hate honest and tough criminal defense attorneys. Ever since Reagan was elected president in 1980 and commenced an undeclared and ever escalating war against them, corruption has been increasing. Now it has reached the point where the criminal justice system is an openly corrupt and stinking sewer in many parts of the country. You are currently browsing the archives for the exculpatory blood tests category.